In general, secondary sources provide the best starting point for research on the Charter. Some key titles are listed here. This is the authoritative, article-by-article account of the legislative history, interpretation, and practical application of each and every Charter provision. Written by a team of scholars and practitioners, this book combines academic research with the insights of practice, and is an indispensable work of reference for all those interested in the UN. The fifth, revised edition of International Institutional Law covers the most recent developments in the field and offers a comparative analysis of the institutional law of international organizations. It includes comparative chapters on the rules and practices concerning membership, institutional structure, decision-making, financing, legal order, supervision and sanctions, legal status and external relations. Combines primary materials with commentary, demonstrating the interaction between law and practice in the UN organization, as well as the possibilities and limitations of multilateral institutions in general. Each chapter begins with a short introductory essay by the authors that describes how the documents that follow illustrate a set of legal, institutional, and political issues relevant to the practice of diplomacy and the development of public international law through the United Nations. This new edition contains over 1,619 articles covering the full breadth of international law. Articles address the history and theory of international law; all sub-fields such as international criminal law, environmental law, and economic law; leading cases; and significant treaties, organizations, armed conflicts, and geographical issues. Each article contains cross-references to related articles, and includes a selected bibliography. An authoritative and comprehensive study of the United Nations' legal practice, this volume covers the formal structures of the UN as it has expanded over the years, and all that this complex organization does. In examining the evolving structures and ever expanding work of the United Nations, this volume follows the tradition of Oppenheim by presenting facts in a succinct text that also offers in the footnotes a wealth of information and ideas to be explored. Itis book that explains the workings of the legal practice of the UN. An authoritative, one-volume treatment of sixty years of history of the United Nations. Citations and suggested readings contain a wealth of primary and secondary references to the history, politics, and law of the world organization. Explains the Council's role in its wider UN Charter context and examines its relations with other UN organs and with its own subsidiary bodies. Contains detailed analysis of voting and decision-taking by the Council, as well as the place, format, and conduct of meetings. UNBISnet search results for non-UN publications about the Charter of the United Nations. Search in DAG Discovery for books, e-books, and electronic journal articles about the Charter of the United Nations. Full text access to subscription electronic resources available at UNHQ and subscribing institutions. Accessible at UN Headquarters in New York and through other subscribing institutions. Please contact your library for guidance. Available at UNHQ and other subscribing institutions. 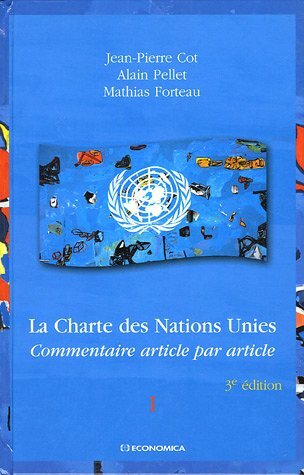 Max Planck Encyclopedia of Public International Law : United Nations Charter, by Cot, 2011. Article on the Charter from the Max Planck Encyclopedia of Public International Law, with a brief drafting history, and sections on Structure and Semantics; Preamble, Purposes and Principles; Players and Procedures; Revision and Reform; Compact or Constitution? Also includes Select Bibliography and Select Documents sections. Search results in the Max Planck Encyclopedia of Public International Law for articles on the UN Charter. Subscription resource available at UNHQ and other subscribing institutions. Oxford Reports on International Law brings together decisions on public international law from international law courts, domestic courts, and ad hoc tribunals.